Disclaimer: I am not a doctor neither do I work in the medical field. All opinions in this post are based on my very own experience with our children. The methods I am going to share are what worked for our kids. If you have concerns, always check with your child’s pediatrician. So we bring home our precious little bundles and try our best to make them feel comfortable as best as we know how considering they are now getting used to this “outside” life thing. We give them warm comfi clothing and beautiful bedding; we feed them constantly; and we SNUGGLE. But sometimes our little ones tend to be so uncomfortable despite all our good attempts to make them comfortable and it just breaks mommy and daddy’s hearts. This could be a result of various reasons: one of them being a gassy little stomach. If you are breastfeeding and your newborn baby or young child seems to be fussy and uncomfortable all the time it might be that they are filled with gassiness and they need some relief. Keep in mind that relief may come out in one of three different ways: spitting up, passing gas, or going number two. Would love to know some better (proper) names for these phrases but in any event, if your baby is experiencing gassiness, be encouraged. There are some all-natural steps you can take to help your baby feel better. And help mommy and daddy feel better, too:) These steps have been tried and true with all three of our babies including our new baby (now 5 months old). But before we move unto the steps, let’s first take a look at 3 main reasons why a baby may experience gassiness and then the symptoms of gassiness. Caffeine: Includes foods such as coffee, chocolate, soda pops, caffeinated teas and other caffeinated type beverages. Dairy: Some babies tend to get very gassy from dairy based foods such as milk, yogurt, & cheese. Certain vegetables: Watch out for veges such as broccoli and onions. My babies had high resistance and massive gassiness from foods of the like. Other foods may include citrus type fruits such as oranges. I found that my babies were very fussy whenever I drank orange juice. And let us not forget the spicy foods that contain pepper or other strong ingredients. 2) As a result of too much Air: Some babies take in too much air as they nurse or are feed from a bottle. All that air build up needs to escape or else, the baby will be gassy and fussy. 3) As a Result of Natural Reasons: Sometimes a baby’s digestive tract just has to get used to feeding outside of the womb and to figure out its way of operation. If this is the case, it is tough to find methods of relief. It seems like no matter what you try, the baby will continue to be fussy. Eventually though, this will go away on its own. Note: If you ate or drank any of the food and drinks listed above check your baby’s reaction 3 to 6 hours after. If any of the symptoms are present, then maybe you ate something that did not agree with him/her. Always remember though, that the baby could be reacting from taking in too much air or his tiny stomach may be trying to adjust to eating outside of the womb. OK. So here are 7 methods to try if you discover any of the symptoms in your baby. They have worked for us with all three babies. My hubby loves try these to help our kids. 1. First, I know you probably already do this one but try burping the baby over your shoulders or resting him/her downward on your knees. Sometimes, babies just need to burp and even spit up to help them feel better. This has worked for us many times. 2. Gently hold on to baby’s ankles and push them toward his stomach. Hold for 2 -3 seconds then release by stretching out baby’s legs. Repeat this step a couple times. 3. Gently rub babies stomach in a clockwise motion. This follows the path of the large intestines and could help release some gas. Tip: I usually use some baby lotion to rub or massage the area. 4. Gently push on baby’s navel. If you hear a bubbly sound, then most likely some gas has gathered up in there. Pushing on the navel helps release that gas. Be ready, it may come out in one of two ways! 5. Using a thermometer, gently insert it into the baby’s bottom area. Maybe he needs to release some (you know what). I like to add just a tad bit of Vaseline to make the process easier. 6. If you have tried the above methods and still need help, try using some Mommy’s Bliss All-Natural Gripe Water (affiliate link). We began using this with our second child when sometimes, we couldn’t figure out what in the world was going on and we have found it to be very helpful. Follow the dosage instructions on the bottle before giving it to your baby. 7. And here is a great tip that works like a champ, ABSTAIN from eating all your favorite gassy foods for a while. I know, it is so difficult! Especially when you think of that yummy yogurt parfait you desire for breakfast. Or you smell that coffee that your hubby is brewing and you know you need a cup because you were up late with the baby during the night and you just need something to keep your eyes open. Hello! Please tell me I am not alone here! Albeit, I have had to give up certain foods for more than a year during breastfeeding. Yep I said more than a year. I nurse until about 18 months! But it is all for the good of these babies! So these are the things to try at home to help a gassy baby. If you have tried every one (even abstaining) and nothing works, then you may want to check with your baby’s pediatrician to see what is going on in there. Note: Remember, I am not a doctor by any means but I have had three children (one is still very new). Over the years of experiencing gassy babies and talking to the pediatrician, I have learned these tips and tricks. Again, if you have concerns, always check with your child’s pediatrician. 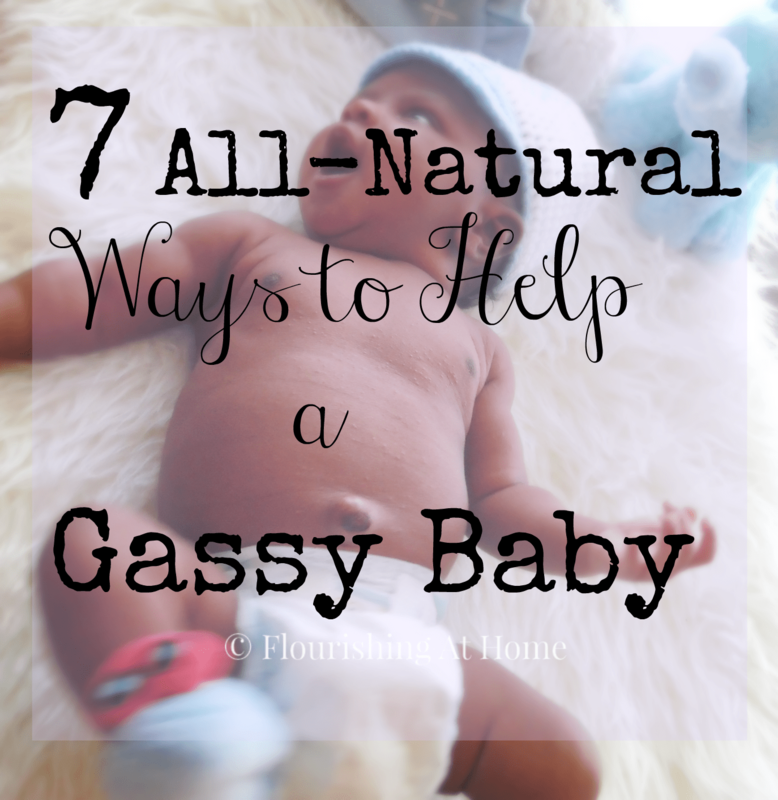 If you have a newborn or a young baby, do you find him/her gassy? If your kids are older, were they gassy babies? What are some natural home methods you’ve tried? Would love to know in the comments! This post contains affiliate links which means I will receive a small compensation if a purchase is made through any of these links. She looketh well to the ways of here household, and eateth not the bread of idleness (Proverbs 31:27, KJV). Harper didn’t have too many gas issues but we would use the second method you have listed to help her tummy on those occasions. My husband called it the “gassy baby massage”! LOL. It worked really well for us. Really great tips! I’m not mom but I have a 8 month old God-daughter and I have used the second & third method on her in combination with the Pandora rock-a-bye baby station lol. I remember my grandmother telling me one time she use to make me gripe water. Gripe water grandma’s way has got to work…LOL! Isn’t it great how natural stuff works? Great ideas! I definitely had this problem with my little guy! Baby massage really helped!! I love the massage solution, too. It really works! I am glad I could help you Stacey! Great tips! My son had bad reactions whenever I ate dairy and he had the exact symptoms you listed. Luckily, we figured out what was causing them pretty quickly. That dairy is no joke when it comes to giving baby gas. Good you figured it out quickly! I switched to decaf before I got pregnant with my first kid and I’ve never looked back (except for the occasional chocolate – wink. wink.). I could always tell when my babies were gassy. I love that all of your tips are all-natural! Natural is always best. Good point about the decaf. I have tried it a few times when I really wanted to taste coffee but knew if I drank the strong one it would make the kids gassy. So pitiful when they have gas 🙁 I always made sure I had some of those Mylacon gas drops on hand when I was nanny for a newborn! I know…I have had to give up some of my favorite foods!